Institutional investors including insurers, savings banks and pension funds are debating whether to store cash in vaults as overnight deposit rates fall deeper below zero and negative yields dent investment returns. The costs associated with insurance and logistics may outweigh the benefits of taking this step. Munich Re’s move comes after the European Central Bank last week cut the rate on the deposit facility, which banks use to park excess funds, to minus 0.4 percent. Munich Re’s strategy, if followed by others, could undermine the ECB’s policy of imposing a sub-zero deposit rate to push down market credit costs and spur lending. Cash hoarding threatens to disrupt the transmission of that policy to the real economy. Munich Re wants to test how practical it would be to store banknotes having already kept some of its gold in vaults, von Bomhard said. This comes at a time when consumers are increasingly using credit cards and electronic banking to pay for transactions. Deutsche Bank AG Chief Executive Officer John Cryan in January predicted the disappearance of physical cash within a decade. Accountancy rules require companies to assess projected pension liabilities using a discount rate based on the prevailing yield of investment-grade corporate bonds. The calculations determine how much companies must set aside now to fund future obligations. Falling bond yields result in a lower discount rate, which in turn increases the costs of meeting those obligations. In short: pension deficits get bigger. Paul Watters, credit analyst at Standard & Poor's, estimates that a 1 percentage-point decline in the discount rate tends to increase pension obligations by about 16 percent at large companies with the most-exposed pension plans. Total pension obligations for companies in Germany's Dax had increased 24 percent to 372 billion euros in 2014 but declined by about 10 billion euros in 2015, according to Mercer, a consultancy. The funding ratio (of pension assets to obligations) improved from 61 percent to 65 percent last year. This may all sound a bit dull, but it has important consequences for companies, investors, the economy, and of course, employees. If companies divert capital to plug a hole in the pension fund, they have less cash to fund capital investments. A big pension deficit hanging over a company means employees are also less likely to be able to win pay increases. Widening pension deficits could therefore create a headwind to QE's effectiveness. Credit-rating companies pay attention to pension deficits, and bigger shortfalls might prompt them to raise a flag that could feed into higher borrowing costs -- another drain on cash. Ballooning gaps also make equity investors nervous because dividend payments can come under pressure. These can counteract QE's beneficial effect of cutting bond yields and boosting equities. Regulators could create a bit of breathing space for companies by allowing them to take less rigid approach to setting pension discount rates. Where permitted, corporate pension plans should also consider diversifying further into riskier assets like property and infrastructure -- that would help in particular in Germany, where pension funds are often weighted heavily towards low-yielding bonds. First CORPORATE credit to issue with a negative yield. Utter failure by central banks, yet they continue to do more of it. So what happens when the Central Banks still don't get the growth and inflation they are looking for? Even more negative rates? This is becoming absurd. that's where "helicopter" money occurs. It by passes the banks altogether and puts the money "directly' in the consumer who will spend it (at least that's the central bankers hope). free advice - be very careful in these unprecedented times. unintended consequences can result. Sure large risk can reap large rewards no doubt, just don't wager money you "need' for retirement, etc. This time could be a great history lesson for future people. 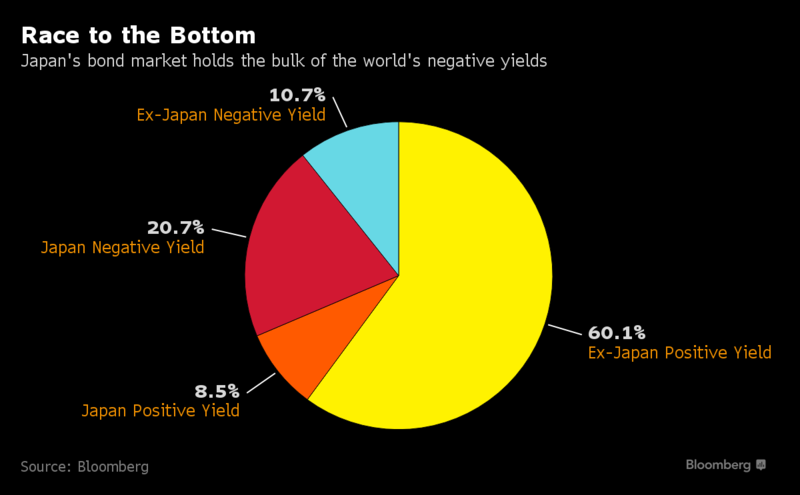 Japan’s dysfunctional bond market is not only inverted between three month and eight years, it also sports negative yields out to 10 years. The yield curve also inverts between 30 and 40 years, albeit in positive territory. Inverted means longer-dated bonds yield less than shorter-dated bonds. The above quote from an excellent Bloomberg article entitled Japan’s Bond Market Is Close to Breaking Point. Third, if negative interest rates go beyond perceived thresholds of reasonableness and sustainability, the operating modalities of certain markets could change. This dynamic may be playing out in the recent puzzling behavior of foreign-exchange markets after both the Bank of Japan and the ECB adopted and reinforced their negative rates policy. Rather than depreciate, both the yen and the euro have appreciated. Although some of these counterintuitive moves reflect a somewhat more dovish Federal Reserve, which has mitigated expectations of highly divergent interest rates among the world's central banks, there could well be something bigger in play: Specifically, the dilution of interest-rate differentials as the main driver of currency values, particularly as greater attention is paid to stock effects, including the ability of citizens to repatriate capital from abroad. This is an especial concern for Japan. All this calls for further analysis and more open-mindedness from economists when assessing how the global economic and financial system is likely to operate now that about one-third of global government debt is trading at negative nominal yields. Specifically, stock effects and behavioral influences could alter the conclusions that are derived from an analysis based primarily on interest-rate differentials and other relative pricing considerations. Should this prove to be the case, and I suspect it will, the implications for investors and traders would go well beyond the potential of a new set of unintended and unusual potential headwinds to economic growth and corporate earnings. The new understanding would require altering pricing models for foreign-exchange markets, recasting assumptions about correlations among different asset classes, being more open to the possibility of sudden market jumps and air pockets, and factoring in a larger liquidity risk premium. TOKYO, April 7 Many Japanese companies are facing a big increase in pension liabilities thanks to the Bank of Japan's (BOJ) adoption of negative interest rates in January. While the BOJ's negative rates policy was intended to spur lending and stimulate Japan's stagnant economy, it has created problems for corporate pension plans, which depend on the yield earned from high-grade bonds, such as government debt, to meet future pension payments. They now require more assets to generate the same returns. Based on recent financial statements from around 1,700 listed companies, Goldman Sachs estimates that a 50 basis point drop in the discount rate, which is used to calculate future pensions and roughly tracks long-term JGB yields, would increase total pension liabilities to 98 trillion yen ($896 billion) from 89 trillion yen. The negative effects are already being felt in the form of lower profits and profit targets. Cleaning services company Duskin Co Ltd, for example, in March cut is operating profit target for fiscal year 2018 to 6 billion yen ($55 million) from an initial 7.5 billion yen due to an expected increase in pension liabilities. Companies with low equity ratios - those where creditors own a larger proportion of their assets than shareholders - are especially vulnerable to increased pension liabilities because they have to spend a larger percentage of their earnings to repay creditors, analysts say. "As declining yields enlarge the present value of their pension liabilities, companies with low equity ratios face erosion of their capital," said Hiromi Suzuki, a strategist at Goldman Sachs in Tokyo. The total amount of cash stashed at home is estimated to have surged by nearly ¥5 trillion to some ¥40 trillion in the past year, Hideo Kumano, chief economist at Dai-ichi Life Research Institute, said. 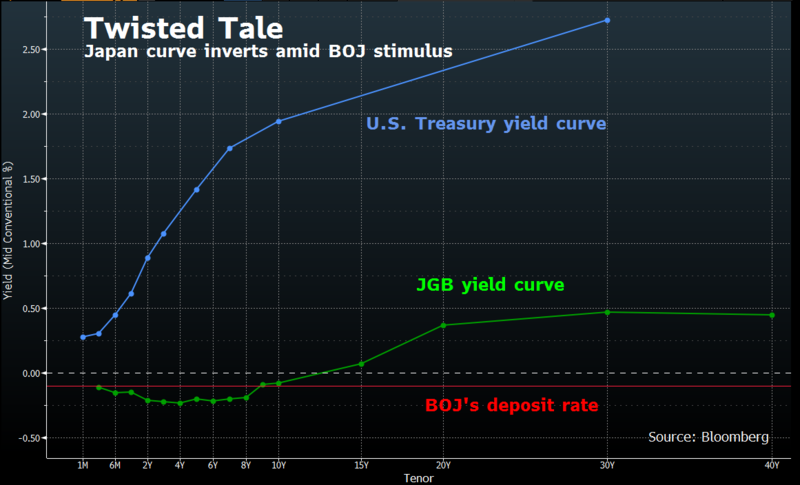 “To our surprise, Japanese retirees have been willing to hold government debt at zero rates, but the marginal investor will soon not be a Japanese retiree,” he said. Prof Blanchard said the Japanese treasury will have to tap foreign funds to plug the gap and this will prove far more costly, threatening to bring the long-feared funding crisis to a head. “If and when US hedge funds become the marginal Japanese debt, they are going to ask for a substantial spread,” he told the Telegraph, speaking at the Ambrosetti forum of world policy-makers on Lake Como.